Manchester United striker Wayne Rooney is ready to make a big impact at this summer's World Cup, according to interim manager Ryan Giggs. Rooney has endured a succession of tournament failures since bursting onto the international scene at Euro 2004. However, Giggs feels the England man can enjoy more success in Brazil. Phil Jones: Made international debut aged 19 in 2-2 draw away to Montenegro in Euro 2012 qualifier in October 2011. Has nine England caps and no goals. Wayne Rooney: Made international debut aged 17 in 3-1 home friendly defeat by Australia in February 2003. Has 89 England caps and 38 goals. "Wayne is a top player," said Giggs. "He is at a good age. He is probably at the peak of his powers and I know for a fact he can't wait for it." Rooney is unlikely to be involved in United's final Premier League game at Southampton on Sunday after suffering a minor groin injury. Yet Giggs is not concerned it will affect Rooney's World Cup preparations - confirming both the forward and defender Phil Jones, whose tournament seemed to be in doubt when he was forced out of Tuesday's 3-1 win against Hull with a shoulder injury, will be fit. That will be a relief for England boss Roy Hodgson, who is due to name a provisional 30-man squad for the World Cup on Monday. On Rooney, Giggs said: "He is training and will be fine for the World Cup. "He has just started (training) over the last couple of days. Sunday is a little bit too soon for him." Jones will also be absent from the United squad that will travel to St Mary's at the end of such a disappointing season. "The injury is not as bad as I thought," Giggs said. "He won't be fit for Sunday but he will be OK for the World Cup." Giggs was never able to qualify for a World Cup with Wales during his own international career, and he wishes he had the opportunity ahead of Rooney and his England team-mates flying out to Brazil in a few weeks' time. "We have all watched Brazilian teams over the years and to actually play in a World Cup in Brazil is something I wished I had the pleasure of doing," said Giggs. 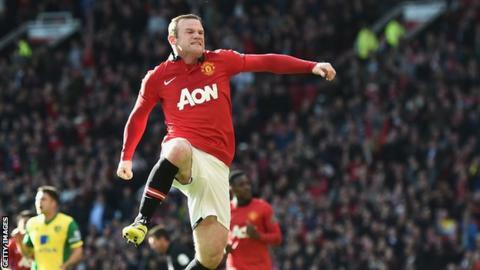 "Wayne has had a fantastic season. He is going away next week and working on his fitness so this little groin strain has probably helped him because he will be going into it relatively fresh. "And the vibrant young players around him can only help."